Courtroom B inside the Delaware Municipal Court was packed Monday with Liberty Township residents. Seated in front of the residents, left to right, are the lawyer for Trustee Michael Gemperline, Gemperline, and Gary Yashko, the attorney representing township residents. 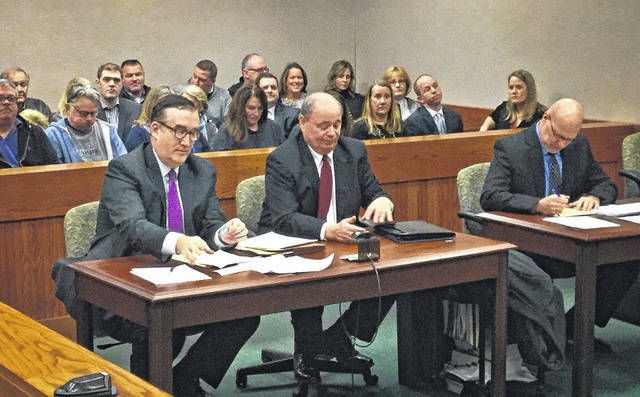 A group of Liberty Township residents was turned away Monday from the Delaware Municipal Court without a resolution to its motion asking a judge to increase Melanie Leneghan and Michael Gemperline’s bonds as trustees to $1 million. The hearing is rescheduled for 2:30 p.m. on Monday, Feb. 11. Yashko said this is the first time a motion has been filed to increase an elected official’s bond. He said no one could get everything together in such a short time to have a hearing six days later. Yashko said a special judge was brought in from Huron County to hear the case because of the local judges’ familiarity with the trustees, and to avoid any appearance of impropriety. He said the judge didn’t seem well versed in this particular section of the Ohio Revised Code. “I don’t think there is any judge that’s well versed in this section of the code, but he does have a firm understanding of the overview issues,” Yashko said. Gemperline sat in the courtroom at the defendant’s table while the judge met in chambers with his attorney and Yashko. Margaret Caldwell, one of the 24 Liberty Township residents who signed the petition to file the motion, said she wasn’t sure what to think about the case being rescheduled. Sue Braden, another one of the petitioners, said she was disappointed there was no outcome Monday in the case. The petition, signed by 24 township residents, was filed in the court by the Law Office of Gary Yashko, Powell, on Tuesday, Jan. 22. “Now come the applicants, identified in the petition … respectfully ask this court to order Liberty Township Trustees Michael Gemperline and Melanie Leneghan to increase the bonds they hold as a condition of their office to an amount equal to one million dollars each,” the court filing states. The group’s motion comes on the heels of the recent actions of the trustees that have led or could further lead to legal actions against the township. However, she indicated that both of the trustees will be represented by a single attorney, while her personal interest will be guarded by a second attorney employed by herself. Leneghan was not present at the Monday hearing nor were there any other attorneys present to represent her personal interest in the matter. This entry was tagged Bond, D. Anthony Botkin, Gary Yashko, Liberty Township, Melanie Leneghan, Mike Gemperline, Trustees. Bookmark the permalink.